I am fortunate that my kids have always been good eaters and are open to trying different kinds of foods. That is until we start talking about vegetables. When it comes to vegetables, their sense of adventure pretty much ends at broccoli and carrots (and this spinach tart). I am hopeful that one day they will grow to love roasted brussels sprouts and beets, kale salads, baked sweet potatoes and all the other wonderful tastes the vegetable world has to offer. In the meantime, rather than continually fight the ‘eat your vegetables’ battle, I try to work with what they are willing to eat. This salad helps. 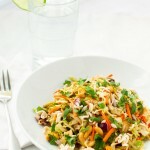 The basis for this salad is broccoli slaw and shredded carrots. Then you can customize it according to your tastes (and what happens to be in your refrigerator). For my family, I start with broccoli slaw, carrots, and cabbage. Then I set out everything else and let everyone mix their own salad. My salad always gets a little bit of everything. My husband adds everything except the cilantro. The kids try to add as little as they can get away with. But EVERYONE adds the crunchy noodles. Put all the dressing ingredients into a jar, screw on cap tightly, and shake vigorously until everything is incorporated. Mix desired amounts of vegetables, sunflower seeds, nuts, etc. together in a large bowl. Add dressing to taste (you want to flavor the salad but not drown the vegetables). Toss. Add the ramen noodles. Toss again and serve immediately so the noodles stay crunchy. Broccoli slaw can be found at most grocery stores. It is usually in the same section as the pre-packaged salads. I also use pre-shredded cabbage which is available in the same section. You can buy pre-shredded carrots or shred your own with a food processor, a sharp knife, or this handy tool.